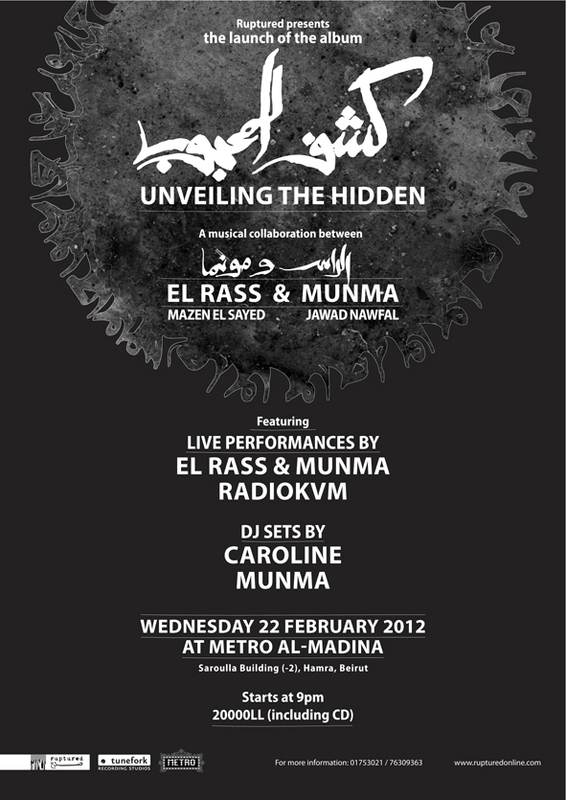 Kachf el Mahjoub / Unveiling the hidden is a musical collaboration between Lebanese poet and musician Mazen el Sayed, otherwise known as El Rass (The Head), and Lebanese electronica artist Jawad Nawfal aka Munma. El Sayed is a prolific writer and musician, at ease with a variety of instruments, while Nawfal has previously released an impressive number of albums and EPs, exploring downtempo electronica and ambient dubstep. The collision of harsh beats and brazen, slammed vocals works wonders on Unveiling the Hidden, a truly outstanding collaboration between Nawfal’s Munma project and Mazen el Sayed’s El Rass persona, produced and released by independent Lebanese label Ruptured. Notorious for his masterful flow in the classical Arabic language, quite an uncommon phenomenon in Lebanon’s exuberant rap scene, El Rass is impressive on Unveiling the Hidden, with lyrics tackling both social and political sensitive subjects. Munma, on the other hand, creates a sound-world perfectly fitting El Rass’s agitated discourse, alternating between broken beats, elaborate percussion, and ambient layers of synths. At times reminiscent of mutant hiphop outfit Shabazz Palaces, at others of the collaboration between dubstep producer Kode9 and vocalist The SpaceApe, this album is an uncanny meeting of Arabic hip-hop and electronica, and represents an exceptional event in the realm of contemporary Lebanese alternative music.